Longtime Vegbooks readers will remember Jessica’s delighted reviews of Ladybug Girl and Ladybug Girl at the Beach. 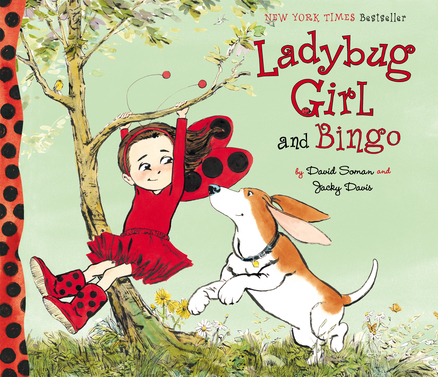 In the latest book in the Ladybug Girl series, Ladybug Girl and Bingo, Lulu (alter ego: Ladybug Girl) is off on a camping adventure with her family, complete with new sleeping bag and lovable basset hound Bingo. Much of the focus of this adorable story is on the family’s attempts to keep Bingo safe in the great outdoors. Author-illustrator team Jacky Davis and David Soman does a fantastic job of portraying an outdoorsy family trip with a curious dog whose nose just wants to sniff, sniff and sniff some more. There are many times when someone (not infrequently Ladybug Girl) is reminded to hold on to Bingo’s leash to prevent Bingo’s explorations from taking him too far afield. When the family rents a canoe, Ladybug Girl is relieved that they don’t have to worry about Bingo running off from their boat in the middle of the lake. The illustration of the entire family enjoying a peaceful moment in the middle of the lake is a favorite, though it has some stiff competition. Eventually Bingo’s nose (and a teasing fox) cause Ladybug Girl some headaches, but she remains calm and models problem solving for young readers. And Bingo’s nose saves the day (kinda). We also get a hint at a new alter ego for Lulu — could a nocturnal story be next in this sweet series? Families who have experienced the outdoors with curious kids and dogs will particularly relate to this tale, but even if your family is more of the enjoying-the-indoors type, don’t let that dissuade you from checking out this witty, clever and true-to-life portrayal of a young family which emphasizes care for their four legged family member. Vegan folks may want to be aware that the family is shown enjoying a picnic featuring cheese.